Warsaw’s Powisle Station. Photo Owen Hathersley. I have always regarded Warsaw’s railway stations as worthy of nothing but cold contempt – fading examples of communist triumphalism left over from the days when a passenger was regarded as an unfortunate accretion. So it is a shock to read an article about Warsaw’s railway stations where the author actually likes what he sees. Owen Hatherley’s Polish history is a little flakey, elsewhere he describes the Armia Krajowa as the nationalist resistance force that opposed the establishment of semi-colonial Stalinism after 1944. Accordingly, the state from the ’40s to ’80s didn’t know quite what to do with them, alternately suppressing and immortalising its memory, according to the political needs of the day. However, as regards modern architecture Hatherley is first rate. Are Warsaw’s railway stations worthy of preservation? Read his article and decide for yourself. Track lifting has started at Swiecie station on the short branch line from Terespol Pomorski to Swiecie nad Wisla. The station site at Swiecie has been bought by Swiecie Town Council for 2 million PLN in order to build a car park and a new road. The branch line to Swiecie nad Wisla. Background map ©Google. Railway map ©PPWK, Kolejowa Mapa Polski. Px48-1907 in ex-works condition at Nowy Dwor Gdanski, 25.5.2010. From a photo by Feyg. The last time I saw Px48-1907 (in 1999 or thereabouts) the engine was behind a high wire fence in a coal yard in Sompolno – the central depot of the erstwhile Kujawy Railways. Sompolno was still a junction and judging by the shape of the undergrowth occasional trains still pushed their way through the jungle up the line to Piotrkow Kujawski. At the time there was a proposal by one of the local authorities to take over the central section of the Kujawy Railways and run it in the manner of the Gniezno and Krosniewice sections, but the local authorities could not agree about local tax liabilities and nothing happened. Then scrap thieves reduced Sompolno Depot to a hollow shell, PKP lifted the line to Piotrkow Kujawki and Px48-1907 became a ‘Wild West’ exhibit in a restaurant in Chlapowo. 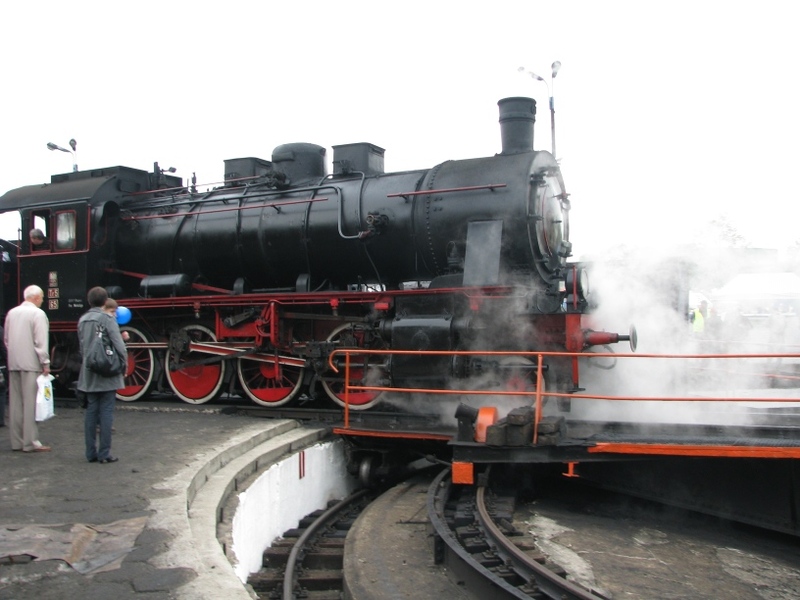 However, on 19 May this year the engine appeared on a flat wagon at Nowy Dwor Gdanski on the Zulawy Railway and on 25 May was steamed and cautiously run around the yard. The events were gloriously recorded by Feyg whose photographs of both events can be enjoyed by clicking on the header photograph. 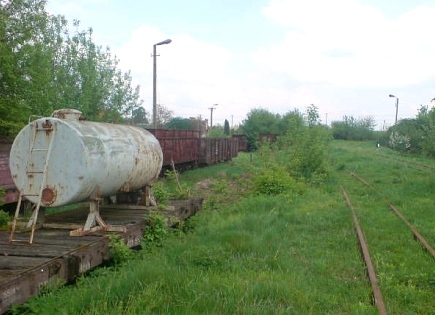 Naleczow yard, April 2010. Photo Grzegorz Sykut. The future of the Naleczow Railway is looking brighter than it has done in years with news that a second EU project for the line has been approved in principle. In February, we reported that the Opole District Council’s Nadwislanska Kolej Waskotorowa project had been approved in principle for EU funding. The snag was that much of this project consisted of ‘soft’ funds which could only be spent on publicity and promotion, although the restoration of certain station buildings was included in its scope. The latest news regarding the project is that documents authorising its start are now ready for signature and that a second project has been approved in principle by the Lublin provincial government. This time the objective of the project will be restore track and rolling stock as well as more station buildings. It is reported that after considering the offers of two external organisations, the district council has decided to go it alone and form its own operating company to run the line. The Starosta (Chief Executive) of the district council has expressed the hope that services could start as early as June this year. However, bearing in mind the need to carry out essential repairs to the track and to have the line certified as safe, it would be more realistic to expect a section of line to reopen no earlier than Q.3 2010, though Q.2 2011 is probably a more realistic estimate. A small team of volunteers has been working on the line and also keeping its memory alive by publishing articles in the local press. Recently they cut down the bushes covering the track in the foreground of our header picture and last year they gave the shed doors at Karczmiska a much needed coat of paint. They are appealing for donations of paint (black and grey) as well as weedkiller. Please contact Grzegorz Sykut on gsykut[at]gmail.com if you can help. A volunteer paints the shed doors at Karczmiska in 2009. Special train and the line’s supporters, 15:.05.2010. Poland’s General Directorate for National Roads and Motorways (GDDKiA) has begun formal proceedings to close the railway line between Bojanowo and Gora Slaska. The line which still carries a regular freight service lies in the way of the route of the new S5 trunk road. Rather than face the expense of constructing a bridge over the line, the GDDKiA believe it could save itself the cost if the line was closed. The line closure is being opposed by the Gorow District Council and Irena Krzyskievicz, the Mayor of Gora. Some 10 businesses in the area rely on the line’s freight services and there are discussions under way with the provincial government about restoring passenger services using a diesel railcar. 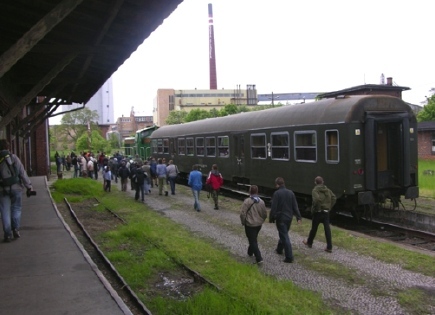 On May 15, the Wroclaw Railway Enthusiasts Club organised a special train on the line to publicise the fight for its survival. The two tracks on the left lead to the site of Gdansk’s first railway station. Photo Ewa Kowalska. In a frank interview with wnp.pl’s Piotr Stefaniak, Zbigniew Szafranski, the chairman of Poland State Railway’s infrastructure company PKP PLK, paints a stark picture about the deteriorating Polish railway network. For many years we have been running a deficit as regards the amount of track that we rennovate and the track where we have to apply speed limits. This year we have had to reduce speed limits on 1,477 km of track and we have raised speed limits on only 638 km. Our schedule for 2011 is even worse, we will be able to raise speed limits on 421 km of track, but we will be reducing speed limits on 1978 km. We are also assuming that we will be closing 1,523 km of track. Currently we are running on just over 19 thousand route kilometres, ten years ago it was 23 thousand. We have over 5,000 temporary speed restrictions. This works out on average as one such speed restriction every 4 km. Although it’s true that such bottlenecks aren’t evenly distributed. If someone travels from Krakow to Rzeszow they will encounter 80 such speed restrictions. The journey turns into a nightmare. Szafranski goes on to explain that by 2015, some 3,600 route km of track will have been renovated – leaving the remaining 15,400 km in a worse state than they were before! Although the EU is contributing some 4,300 million PLN to upgrade the so-called TEN-T routes, for this to happen PKP PLK needs to find some 5,600 million PLN of match funding. Unfortunately, the money for this simply isn’t there – it will have to be borrowed from the European Investment bank saddling PKP with heavy debt servicing costs. Szafranski reckons it would cost 47,000 million PLN to bring the rest of the network up to scratch. At the current rate of progress this would take him 43 years! 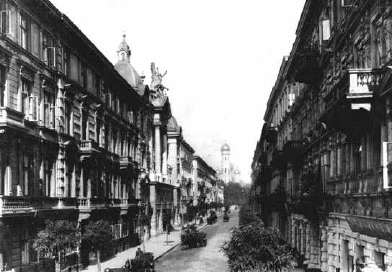 While browsing the Web, I came across some old images of Warsaw. 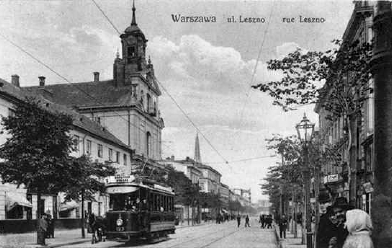 Before WW II, Warsaw was called ‘Paris of the East’. Some pre WWII Warsaw trams still work in departmental service. 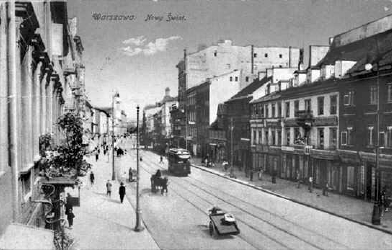 Nowy Swiat looked better with trams running down the middle. 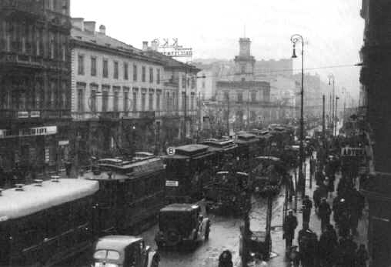 It seems that trams ‘bunching up’ during the rush hour also happened before WW II! Rescue workers at the Al. Mickieiwicza/Kosciuszki crossroads in Lodz. A serious accident occurred during this morning’s rush hour at the crossroads of Al. Mickiewicza and Al. Kosciuszki in the centre of Lodz. A tram jumped the rails and careered over the tarmac smashing into a metal column supporting the overhead wires which supply the traction current to the tramlines. The driver was killed, 4 people are reported to be fighting for their lives, 7 others are less seriously injured. The crossroads where the accident occurred is one of the busiest ‘flat’ road junctions in the centre of Lodz where the main North – South route through the town centre crosses the main East – West route. Eyewitnesses recall seeing one tram negotiating the southbound turn from Mickiewicza to Kosciuszki successfully. The following tram was supposed to run straight across the junction, but it appears that the point blades did not completely return to the ‘straight through’ position, but took up an intermediate position. When this tram reached the point it derailed and after wobbling, steadied and ran in a south easterly direction across the tarmac until it hit the support column. Lodz residents have long been expressing concern about the state of the tracks on which their trams run and at least one section of tram line has been temporarily closed until the city’s public transport company, MPK-Lodz Sp z o o, aquires the funding to lay a new line. However, the Al. Mickieiwicza / Kosciuszki junction was completely relaid some 2 years ago as part of the 442M PLN Lodz Regional Tram project. There has been some concern about how the tenders to carry out the work were awarded. During the construction phase the local press published photographs depicting alleged shortcomings in the way the construction work was being carried out. At the present the CBA, Poland’s anti-corruption bureau, are investigating whether any irregularities occurred during the LRT project. MPK-Lodz chairman, Krzysztof Wasowicz, and MPK-Lodz MD, Jaroslaw Malec, both were members of the supervisory boards of companies who bid successful tenders for the construction of the LRT. Nasze Miasto – W co graja prezesi MPK? Wolsztyn – Poznan daily scheduled steam train, April 2010. 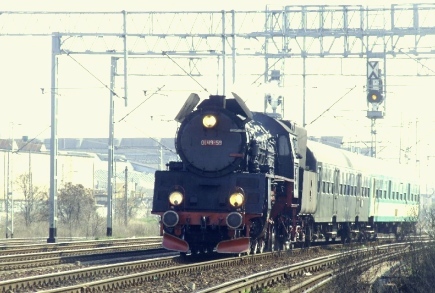 The future of the Wielkopolska’s daily scheduled steam service was in some doubt after Christopher Kaleta, a member of the provincial council, told a press conference today that, because of the planned track renewals between Wolsztyn and Poznan next year, steam services will be suspended on this route. According to Councillor Kaleta, alternative arrangements have been made. 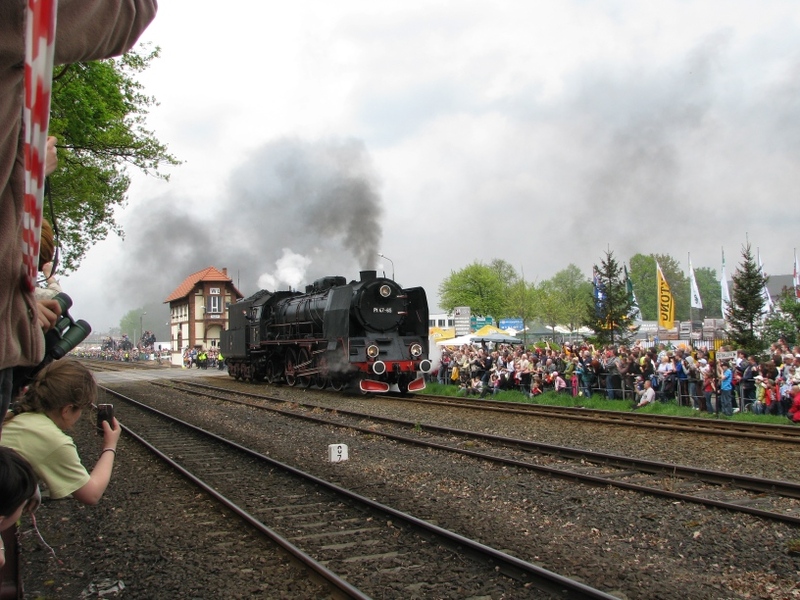 Steam trains will be running instead on all the 115 non-working days in 2011 on the route Wolsztyn – Leszno – Poznan and Gniezno and return. The schedule envisages the train leaving Wolsztyn at 06:00 and arriving at Gniezno at 11:30. The return journey would start at 15:15 and arrive at Wolsztyn some 5½ hours later. 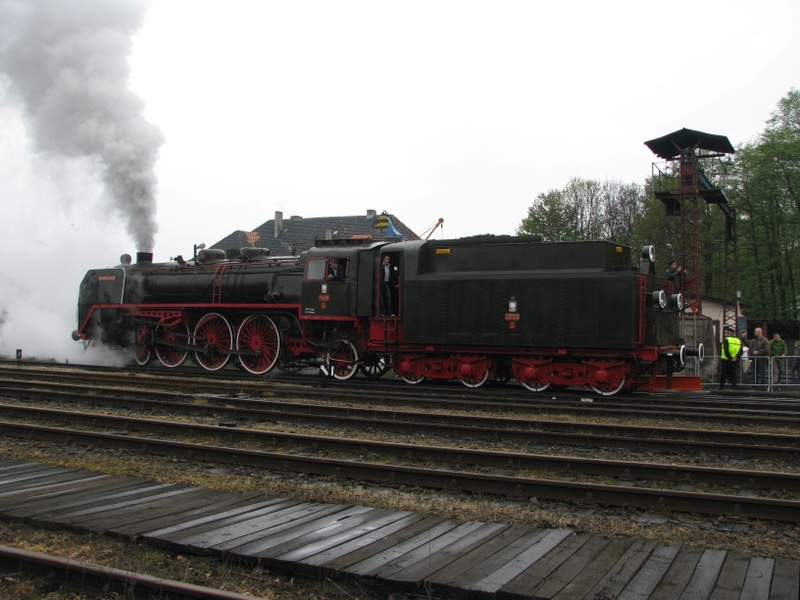 A number of Steam train of Wielkopolska specials are also planned to run on weekends in June and July 2011. The trips will run over some 350 km and could include itinaries such as Wolsztyn – Leszno – Jarocin – Gniezno – Poznan – Leszno – Wolsztyn. Councillor Kaleta emphasized that the total distance travelled by steam trains in the coming year will amount to more than 118 thousand kilometres. For every kilometre the Wielkopolska provincial government will provide a subsidy of 30 PLN, which adds up to more than 3.5 million zł. The arrangements set out by Councillor Kaleta seem a far cry from the promise made by Deputy Governor, Wojciech Jankowiak, as recently as March this year. We do not want another museum. These are many of these already. Only in Wolsztyn is it still possible every day without any fuss to get in a train pulled by a steam locomotive. This is our great asset which we will safeguard at any price. How short is a couple of months in politics! The left hand nameplate of Poland’s most famous steam locomotive Piękna Helena. Photo BTWT. Our colleagues on the polish2english blog take the authorities to task for translating the name of Pm36-2 Piękna Helena into English as Beautiful Helena. polish2english – ‘Beautiful Helena’ ? Passengers in the PKP IC EuroCity train from Villach to Warsaw. Nothing illustrates better the disease that has gripped Poland’s railways than the story published yesterday on Alert24.pl about the experiences of travellers from Austria to Poland on board the Polonia EuroCity express. The train was packed full of returning Poles as well as visitors to Poland. Just before the Czech Republic – Poland border, two carriages were detached and passengers continued their nightmare journey packed tight like sardines, many standing in the corridor or sitting on the floor. Faces with complaints from angry passengers, the guard told them that they should have travelled by car! Vandalised PKP IC coach compartment. Photo Pawcio. Meanwhile a contributor to the infokolej.pl discussion forum reports that many PKP IC carriages – including those that shows signs of recent repairs – have been dumped in a siding in Cracow where they are being stripped by vandals and scrap thieves. A hat tip to Podroznik for both stories. The begining of the end for Interegio? 48 trains stopped by PKP PLK! Passengers aboard a Warsaw – Cracow InterREGIO train. 48 of Przewozy Regionalne’s long-distance InterREGIO trains did not run today follow a decree by Polish State Railways infrastructure subsidiary, PKP PLK. The state owned track company is demanding the payment of outstanding track access charges by Przewozy Regionalne, which is owned by the 16 Polish provinces. The long-distance InterREGIO trains offer a cheap and cheerful rail alternative to long distances buses. They are very popular with many people such as students and pensioners who cannot afford the high charges levied by PKP InterCity. PKP IC, which gears its trains and prices to the needs of business travellers, seems to regard PR’s InterREGIO trains as competition and has long been lobbying for their abolition. Rail Minister, Julius Engelhardt has said that he has no plans to become involved at this stage of the dispute. Wolsztyn Shed, 11.00 hrs. 1.5.2005. Photo BTWT. Two hours or so before the parade. Not a fluorescent jacket or plastic barrier tape to be seen. (They were there, but only where needed to prevent the public from straying over the main line tracks.) Do you remember when shed open days in Britain were like this? 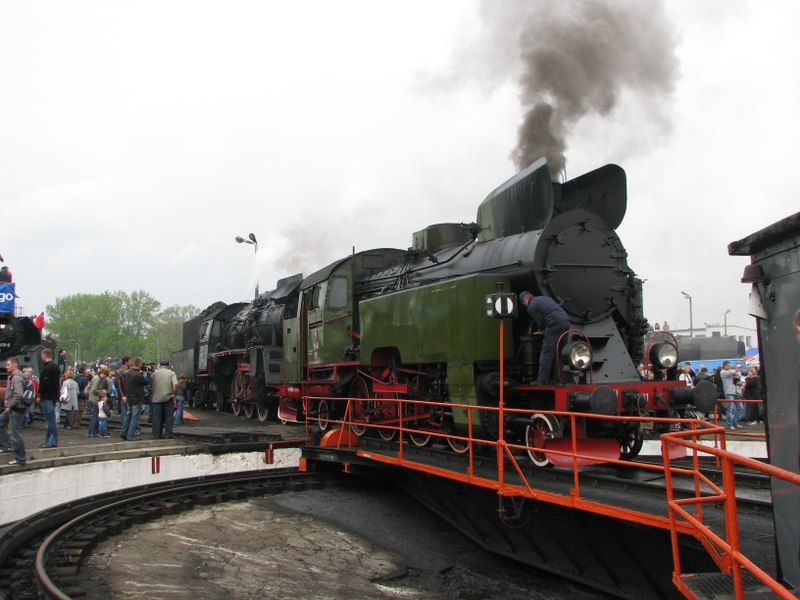 Chabowka Tkt48-91 undergoes some last minute repairs to its air compressor on the Wolsztyn turntable. Photo BTWT. A couple admire PKP 2-8-0 TR5-65, formerly German Railways Br 56.2–8, originally built as a 0-8-0 by Orenstein & Koppel. Photo BTWT. 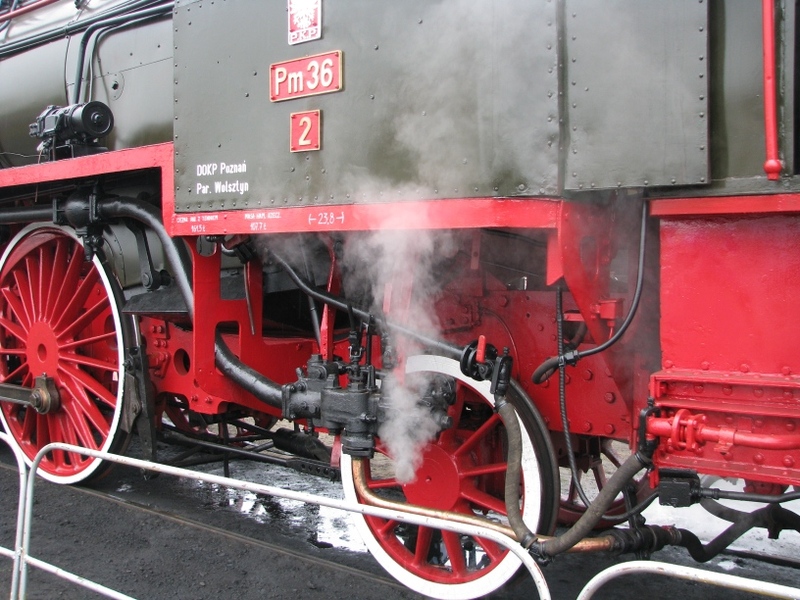 Tr5-65 had its boiler certificate specially extended so that it could attend this year’s Wolsztyn Steam Gala. The photograph also shows how the Wolsztyn turntable was extended to accommodate longer locomotives. Pm36-2 departs the shed to take up its position before the parade. 242.001, a streamlined 4-4-4T light express locomotive visiting Wolsztyn courtesy MAV Noztalgia. Photo BTWT. Only four of these 4-4-4Ts were built between 1936-40, by MÁVAG in Budapest. 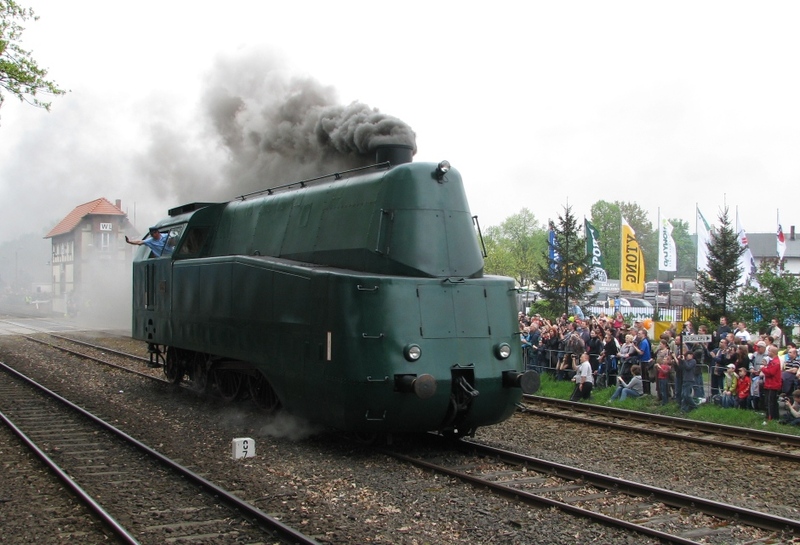 One of them reached 161 km/h on a test run, the speed record for Hungarian steam engines. They used to haul the Baltic-Orient express trains double-headed between Budapest and the Romanian border. Wolsztyn based, Pt47-65. Photo BTWT. 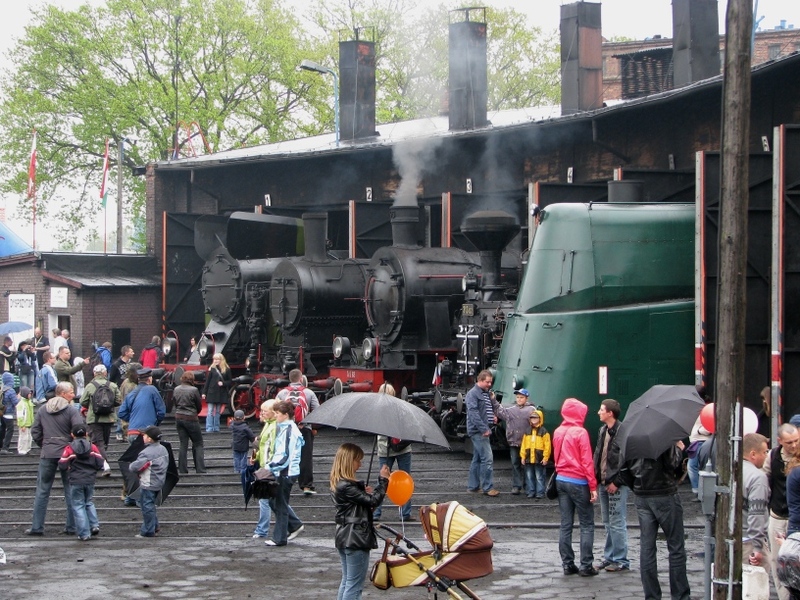 The Wolsztyn Steam Gala is the biggest such event in Poland. Although this year the morning rain damped down attendance, some 15,000 people are estimated to have attended the event. 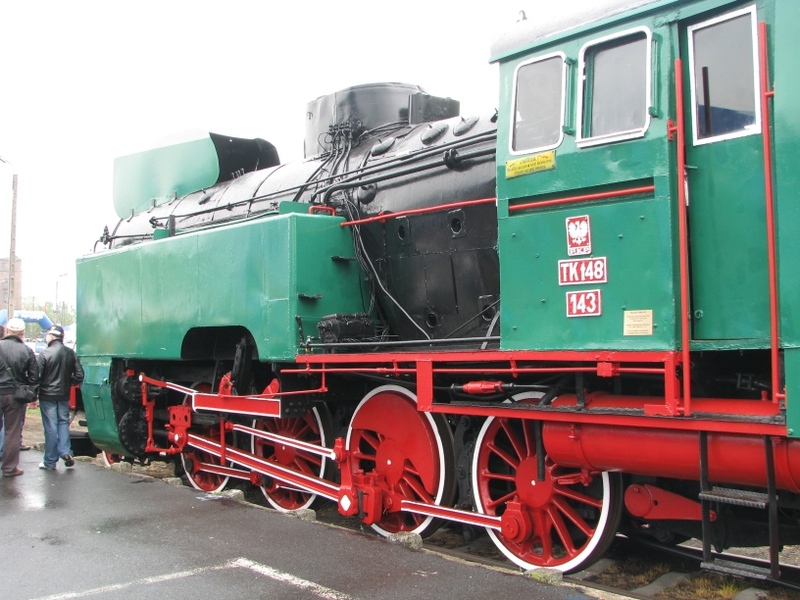 The Wolsztyn Gala plays a major role in spreading the word about steam locomotives and railway heritage in a country where many people regard such matters as embarrassing hand-me-downs from the communist era. 17th Steam Parade banner. Photo BTWT. The text says ‘Seven steam locomotives travelled a total of 2,315 kilometres to reach this year’s parade and will have to travel the same distance to return home’. Fine, but what is the GWR Dean single doing on the bottom right? 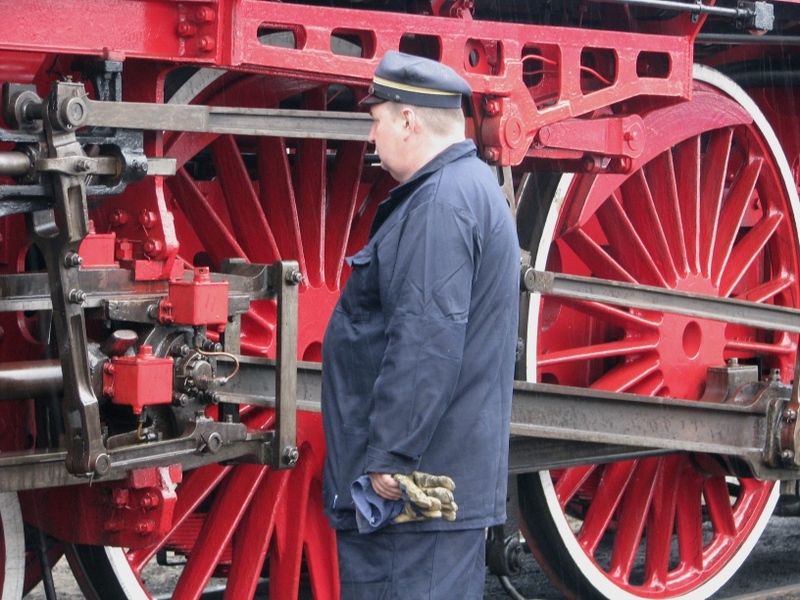 Fireman checks the lubrication on the newly shopped Pm36-2 pacific. Pm36-2 in its new dark olive green livery. TKt48-143 after its cosmetic restoration.